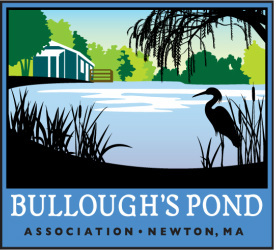 As the seasons change, Bullough’s Pond changes, but the presence of bird life –in varying forms – remains a constant source of enjoyment around this important body of water at the intersection of Commonwealth Avenue and Walnut Street in Newton. 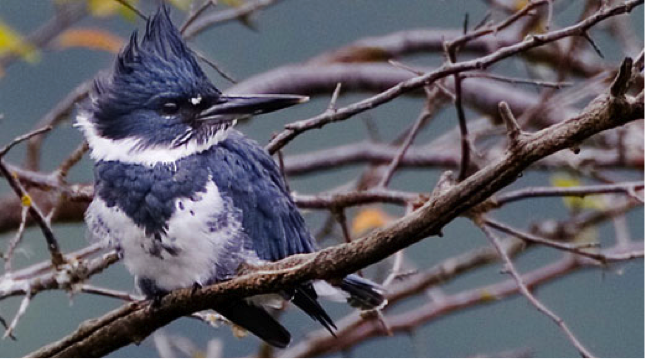 presence of nearly 70 species of birds, ranging from Solitary Sandpiper to Belted Kingfishers to Hooded Mergansers and Turkey Vultures. Sometimes I see ducks or Canada Geese take wing by City Hall only to land a few hundred feet away on Bullough’s Pond, and vice versa. These are in fact two islands of suburban habitat which may be divided by a main road, but which share a common water source and provide an invaluable source of shelter for both migratory and year-round birds. In the winter the trees may be bare and the area around Bullough’s Pond may seem quiet, but upon closer inspection small diving ducks can often be seen out toward the middle of the pond, hunting for food in open patches of water. The male Hooded Merganser is a particularly striking bird, with a wild black and white crest and a bright golden eye. Skittish around people, the Hooded Mergansers will often dive beneath the water only to pop up a few yards away, looking around, alert for danger. In my many winter walks around the pond these ducks have been a frequent companion. And then there are the Common Mergansers, a beautiful sight in the winter especially on gray and dreary days. This large, sleek duck with distinctive white back and greenish head has a serated bill perfect for capturing fish underwater. 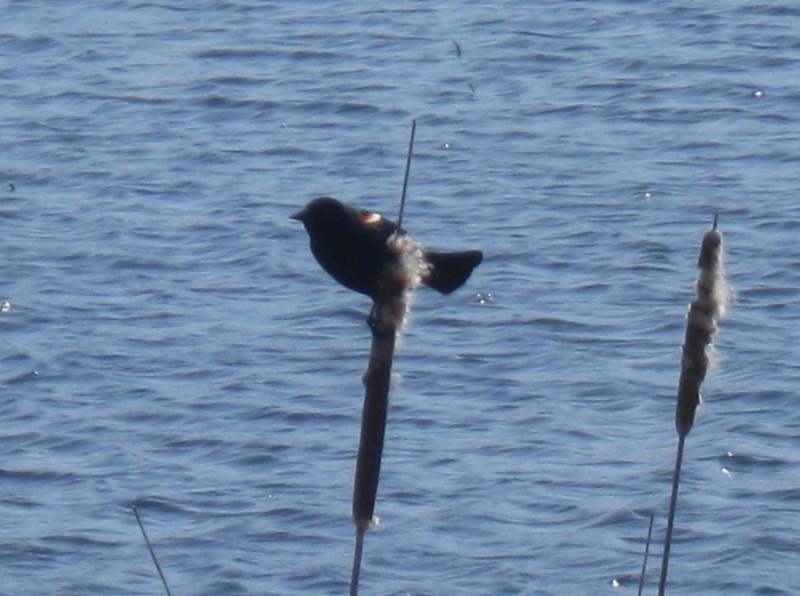 In the spring the Common Grackles and Red-winged Blackbirds return from their southern sojourn, often calling noisily in the afternoons from budding branches that hang out over the water. 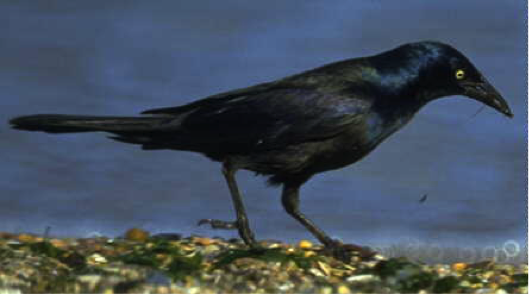 While the blackbirds will occasionally come down to the water’s edge I most often see the grackles there, skulking about at the muddy edges, sometimes bathing noisily in the shallows. 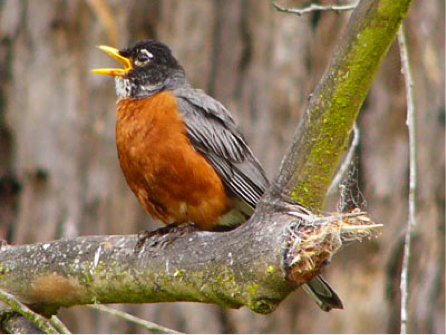 In the evening great throngs of these two species will take to the sky, calling noisily as they go, landing in the high branches of a long row of trees that line Walnut Street, where they settle down to roost for the evening. Meanwhile, Great Blue Herons, tall and silent, will have arrived, favoring the wooded edges of the pond, where passing cars and joggers are less likely to disturb them as they hunt for fish and frogs. Overhead, Belted Kingfishers circle the pond, their rattling call echoing. In the fading light of late evening the Red-winged Blackbirds, American Robins and Canada Geese will settle down in their nests, clearing the skies for owls and bats. As spring gives way and summer slides into place the Common Grackles will still haunt the edges of the pond, but now they are joined by slightly smaller versions of themselves, the young of the year, not yet shiny black and purple, but brown and new. In the late evening the grass and hedges hum with insect life, while swallows patrol overhead. New England’s verdant tangle will have taken over by now, thorns and green arms spreading out, giving the landscape more the look of jungle than suburbia. When the days grow even shorter Bullough’s Pond will begin to get a little quieter. But life never ceases, and the water still flows, streaming in from the culvert that runs beneath Commonwealth Avenue at one end, and exits a raucous bubbling stream at the other, disappearing once again beneath the pavement and reappearing on the other side, reborn and reinvigorated as a winding creek flowing smoothly over its stony bed, past thick woods where Northern Cardinals sit, calling softly. And the cycle continues. Through the seasons, from one year to the next, the waters of Bullough’s Pond continue to offer a calm place to contemplate the natural world as they welcome the birds around us, both resident and passing through. Copyright Daniel E. Levenson 2013. Mr. Levenson kindly wrote this article specifically for the Bullough’s Pond Association website. 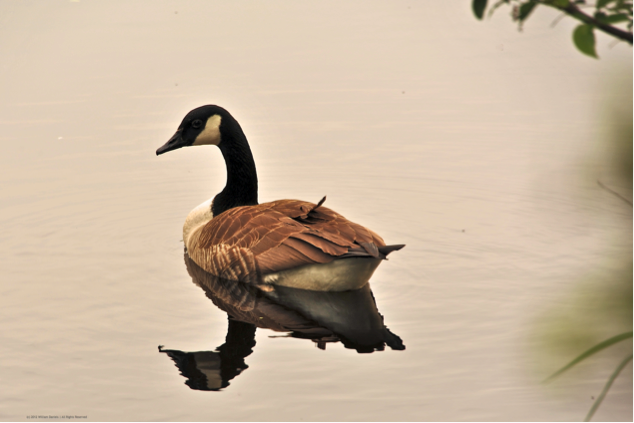 If you see a bird species that's not in our inventory, we'd be grateful if you'd kindly contact us with the species name, the date and the approximate location in or around the pond where it was seen. Thank you!